Claude Giroux's (center) last 21 games have included nine goals and 15 assists, which includes a six-game points streak. As Claude Giroux goes, so goes the Philadelphia Flyers? As can happen with Philadelphia players (we’re channeling Ilya Bryzgalov), Giroux has a massive contract that is set to begin next season — eight years, $66.2 million that will pay him $10 million in 2014-15 — and yet the 25-year-old center began this season badly underperforming. The same player who finished third in the NHL in points in 2011-12 went without a goal for the first month of the season, as goal No. 1 came in Game 16. During those opening 15 games, Giroux tallied only seven assists. Since then, he has produced at a rate that is better than a point per game: nine goals and 15 assists in his last 21 games. He is currently riding a six-game points streak during which he has 14 points overall (three goals and 11 assists). During the first 15 games when Giroux failed to score, the Flyers went a miserable 4-10-1. Since, they are 12-6-3. See a connection? With Giroux being the playmaker he is, he also is helping to ignite linemate Jakub Voracek. Voracek’s 23 points (nine goals and 14 assists) rank second on the team. In the right wing’s last seven games, he has six goals and 11 assists. Coach Craig Berube, given the job three games in after Peter Laviolette was fired, spoke of the difference in Giroux’s game of late to the Philadelphia Inquirer, saying the smallish Giroux (5-foot-11, 172 pounds) was playing more physically. He is "separating people from the puck, being hard on the puck," Berube — a physical player himself during his NHL days — told the ‘Inquirer.’ "He’s always worked hard … Sometimes you just don’t get involved enough and you’re a little bit on the outside. "Right now he’s not. He’s shooting the puck. Both him and Jake (Voracek) are shooting the puck a lot. To me, that’s the key. When you shoot the puck, good things happen." With Giroux so hot, it will be interesting to see if he can land a spot on Canada’s Olympic team. With Canada loaded up the middle — Sidney Crosby, Ryan Getzlaf, John Tavares, Eric Staal, Joe Thornton, Jonathan Toews — Giroux could find himself on the outside. And by that, we do not mean the wing. If he does not earn a roster spot on Team Canada, that could end up being good news for Philadelphia. While the Olympic tournament can tend to tire out players — not to mention injure them — those who do not compete get a nice two-week vacation. Despite their hideous start, the Flyers remain only one point behind New Jersey for the eighth and final playoff spot in the Eastern Conference entering Monday’s games. A hot and rested Giroux could help land them in the postseason and maybe even do some damage. Niklas Backstrom, who is back in front of the net with Josh Harding out, has a 3.19 GAA and .895 save percentage. The Minnesota Wild and its coach entered Monday on the verge of falling out of the top eight in the Western Conference. The Wild have not won in regulation since a 3-1 victory over the San Jose Sharks on Dec. 8 and they are 2-4 in their last six, those only two wins coming via the shootout. Easily the biggest bright spot on the season for the Wild has been the play of goalie Josh Harding, who, in turn, has proved one of the league’s best stories. He is overcoming multiple sclerosis (MS) to have one of the best seasons of any player at his position in the league. Harding ranks first in the NHL in goals-against average (1.51), second in save percentage (.941) and is tied for third in wins (18). While the Wild were struggling recently even with Harding in net, he still helped to backstop them to those shootout victories by holding Colorado to one goal and Vancouver to two in those games. However, the Wild’s play has taken a turn for the worse with the announcement on Dec. 18 that Harding would take a week off to adjust his medications for MS. Harding and the Wild smartly timed the announcement to coincide with the league’s annual holiday shutdown on Dec. 24 and 25 to get Harding a few more days of rest. "Over the next week, Josh will make a minor adjustment to his treatment protocol," Wild general manager Chuck Fletcher said in a statement. "Josh feels great and he looks forward to rejoining our team for our game in Winnipeg on Dec. 27." The problem for the Wild is that playing without Harding has not been their strong suit. Niklas Backstrom, the team’s former No. 1, has been the anti-Harding: he fell to 2-7-2 after a 4-1 loss on Sunday to the New York Rangers and he has a 3.19 GAA and .895 save percentage. The Wild have had four goalies on their roster this season but none other than Harding has registered a win since Backstrom did on Nov. 20 against Ottawa. Harding’s absence from the team had the bad misfortune to come at the same time as a scoring slump by the Wild. During their last six games, they have been outscored by 17-8 (that’s 1.33 goals per game) excluding goals for winning a shootout. All of this may be leading to the fraying of nerves a little bit. Following a 3-1 loss to San Jose on Dec. 12, in which the Wild yielded three power-play goals Yeo accused the Sharks of embellishing to gain power plays and told reporters after the game, "I guess we’ve got to ask our players to embellish more." Yeo clearly regretted those words and called the next day to apologize to San Jose coach Todd McLellan. McLellan, speaking to reporters in Nashville two days after the game, was so angry, he had planned to give video clips to the media until Yeo apologized. "In all fairness to him, it can be emotional time after a game for a coach," McLellan said. "I know I’ve been in that situation before. Once you say something, it’s hard to take it back but I appreciate him reaching out and clarifying that." The Wild had one more game left on Monday — at Philadelphia, their second game in two days on the road — before a four-day break. They will need it to regroup and try to get the season turned back around. 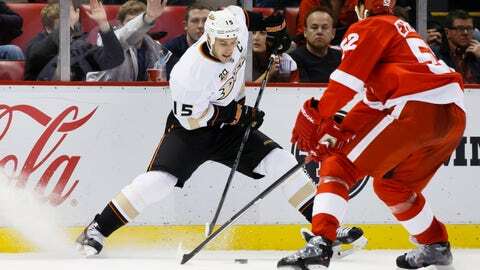 Ryan Getzlaf and the Pacific-leading Ducks are 8-0-2 in their last 10 games. Ducks coach Bruce Boudreau, the former Washington coach, had his team riding an eight-game winning streak entering Monday’s game at the Verizon Center against his old team. The Blackhawks are getting by nicely without injured goalies Corey Crawford, Nikolai Khabibulin. Antti Raanta is 7-1-2. The Penguins have won seven in a row despite being ravaged by injuries to top defensemen, stars like Evgeni Malkin. The Blues added to NHL-best plus-44 goal differential by dispatching Edmonton 6-0 on Saturday. Rookie goalie Martin Jones improved to 8-0 to start his NHL career with a 3-2 shootout win over Colorado on Saturday in which he made 23 saves. At 9-10-1, former Vezina Trophy-winning goalie Tim Thomas is edging closer to .500. The spunky Flames have lost by more than one goal only twice in last three weeks. The Sabres won two in a row last week in regulation by identical 4-2 scores. The Isles earned points in three straight last week (1-0-2). Having goalie Evgeni Nabokov (6-5-5 record) healthy helps. The Oilers have lost six in a row. It’s been a rough start for rookie coach Dallas Eakins. The Blues are looking for their third straight win over Patrick Kane and the defending champion Blackhawks this season. These top two teams in the Central Division also happen to rank among the top five in the NHL in points. (The Blues continue to lag in games played and with three games in hand on Anaheim, which has the most points in the NHL entering Monday, could theoretically lead the league if those games translate into wins.) With the NHL’s new playoff format, the Blues and Blackhawks could end up meeting in the second round of the playoffs, which would be a gigantic tilt. St. Louis won the first two regular-season meetings this by 3-2 scores, the first coming in regulation and the second in a shootout. They do not meet again until March 19. Their final game comes on April 6, one week before the regular season ends. Surely, the defending Stanley Cup champions will want to put a win under their belt against this long-time foe sometime before the spring. In a 4-3 overtime win on Saturday over Ottawa, the team that drafted him and with which he spent his first five seasons, Vermette netted a hat trick and finished plus-1 with five shots, one hit, three blocked shots, one giveaway, three takeaways and won 59 percent of his faceoffs in 22:20. He scored the tying goal on the power play with 2:13 left in regulation and then the game-winner at 2:23 for his 12th of the season. He is on pace for his first 20-goal season since he totaled 27 for Columbus in 2009-10 — although his 13 last season would have gotten him there last season over a full 82 games. In a 4-2 win over Atlantic Division-leading Boston last Thursday, the undrafted free agent out of the University of Maine recorded a goal (shorthanded) and an assist, finishing plus-3 with two shots, one hit and won 64 percent of his faceoffs (9 of 14) in 15:25. Among Sabres who have played at least 20 games, his minus-3 rating is tied for the team lead. In a 5-4 loss to Philadelphia last Thursday, the center finished minus-3 in 16:57 of time on ice with one shot, two hits, two blocked shots and a takeaway. He was on the ice as the Flyers scored the tying goal with 3:46 left in regulation and then the losing goal with 1:38 remaining. He helped to make up for it two nights later by scoring an empty-net goal, his 10th goal of the season, against the same Flyers in a 6-3 victory for the Jackets. Coming out of the NHL’s holiday break, the respective national teams who will compete for gold in Sochi in February will have only 12 days to make their final roster decisions — maybe four or five games at most. However, the U.S. team plans to announce its on Jan. 1 during the NHL Winter Classic so its decisions necessarily are almost set. Goalies (3): Ryan Miller, Buffalo; Jonathan Quick, Los Angeles, Ben Bishop, Tampa Bay. Bishop’s 19 wins are second in the league and he has had to adapt from getting plenty of goal support to winning games that have been played a lot tighter with Steven Stamkos out. At 6-foot-7, he helps to cover a lot of ground. Quick ought to be the starter but he has been out since Nov. 12 with a severe groin strain. Last week, Kings GM Dean Lombardi (an American) and coach Darryl Sutter (a Canadian) tended to disagree on a timetable when Quick might return. Lombardi favored a sooner one that Sutter. The idea is Quick will have plenty of time to round into form. Miller is 8-17-0 for the woeful Sabres, but he has the experience and his .922 save percentage ranks third among American goalies despite the awful team that plays in front of him. Those on the outside could be New Jersey’s Cory Schneider, Ottawa’s Craig Anderson and Detroit’s Jimmy Howard, who is currently injured. Defensemen (8): Ryan Suter, Minnesota; Dustin Byfuglien, Winnipeg; Kevin Shattenkirk, St. Louis; Cam Fowler, Anaheim; Paul Martin, Pittsburgh; Erik Johnson, Colorado; Andy Greene, New Jersey; John Carlson, Washington. This is one of the most difficult groups to pick. Suter is arguably the game’s best defensemen so he’s a lock. Byfuglien, despite what could be his defensive deficiencies on the larger international ice surface, leads all U.S. defensemen in points with 26. He also can play forward if necessary and is an enormous, immovable body in front of the net on the power play. Shattenkirk (25 points) and Fowler (21) aren’t far behind in scoring by defensemen. Martin, Greene and Carlson rank third, fourth and fifth, respectively, in time on ice per game among U.S. defensemen (25:16, 24:54 and 24:37) and supply the kind of skaters the U.S. needs. Martin was injured on Nov. 27 and was expected to be out four to six weeks, potentially putting his selection at risk. The same also could be true for his teammate Brooks Orpik, who brings defensive muscle but remains out with a concussion — a troubling development. Those who could be out include Carolina’s Justin Faulk, Phoenix’s Keith Yandle (in spite of his offense), Columbus’ Jack Johnson, the New York Rangers’ Ryan McDonagh and Winnipeg’s Zach Bogosian. If Martin or Orpik cannot go, McDonagh could be first off the bench. 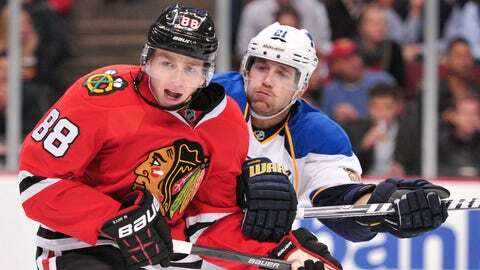 Forwards (14): Patrick Kane, Chicago; Phil Kessel, Toronto; Bobby Ryan, Ottawa; Joe Pavelski, San Jose; David Backes, St. Louis; Zach Parise, Minnesota; Ryan Kesler, Vancouver; Max Pacioretty, Montreal; Jason Pominville, Minnesota; James van Riemsdyk, Toronto; Blake Wheeler, Winnipeg; Dustin Brown, Los Angeles; T.J. Oshie, St. Louis; Ryan Callahan, New York Rangers. Kane is a game-breaker and is having an MVP-caliber season. If he is at the top of his game, he has the potential to score the kinds of goals that could propel the U.S. to big victories — remember, he scored the Stanley Cup-winning goal in 2010 in overtime of Game 6. Kessel is a sniper among the best of them. He has 17 goals, as does the small and speedy Pominville, who would be good on the larger surface. Parise and Kesler rank among the best all-around forwards in the NHL and were essential parts of the ’10 team that earned silver. Pacioretty (14 goals), Wheeler (12) and van Riemsdyk (14) bring size and scoring. Callahan and Brown bring grit and leadership. (Callahan, who is out four to six weeks with a knee that he sprained on Dec. 10, could be in jeopardy to make the roster.) Ryan’s 33 points are tied for second among U.S. forwards. He also adds size and has the experience of the ’10 tournament in Vancouver, although he was young then (he was 22) and only finished with one goal and one assist. Backes is a total package of size and scoring. Pavelski has produced consistently and is accustomed to playing with other highly skilled players on San Jose. It’s also helpful to bring teammates, which is why Oshie could get the nod by playing with Backes on the Blues. Oshie has only four goals but his 26 assists rank second among U.S. forwards. He also is a plus-11. Those who could be on the outside are the Islanders’ Kyle Okposo, who is a minus-7 as his team has disappointed this season, and Chicago’s Brandon Saad, who is only 21 and whose 26 points could be inflated by playing on one of the league’s most skilled teams. Former Olympian Paul Stastny of Colorado might be outcompeted by better depth at center. Vancouver’s Chris Higgins might not be strong enough defensively and Columbus’ Brandon Dubinsky (six goals) might have fallen victim to playing too poorly this season. However, injuries could help to land any of the above on the roster.